New York Times bestselling author Gregory Funaro brings us into a world where magic exists, monsters roam in the shadows, and wooden animals come to life.Deep within the enchanted woods in the town of Watch Hollow stands the once-grand Blackford House, whose halls hold a magical secret: a giant cuckoo clock that does much more than tell time. 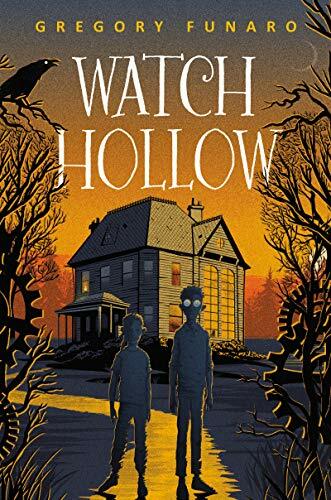 But when the clock’s gears cease to turn, an evil presence lurking among the trees begins to come out of the shadows.When Lucy and Oliver Tinker arrive in Watch Hollow, they have no idea that anything is wrong. A mysterious stranger has made their father an offer that’s too good for him to refuse. All Mr. Tinker needs to do is fix the clock at Blackford House and fistfuls of gold coins are his to keep. It doesn’t take long, however, for the children to realize that there is more to Blackford House than meets the eye. And before they can entirely understand the strange world they’ve stumbled into, Lucy and Oliver must join forces with a host of magical clock animals to defeat the Garr—a vicious monster that not only wants Blackford House for itself, but also seeks to destroy everything the Tinkers hold dear. Watch Hollow is the story of Oliver and Lucy Tinker. A man named Mr. Quigley asks Charles Tinker (Oliver and Lucy's father) to fix a broken clock at a house he bought called Blackford House, which is located in Watch Hollow. The Tinkers accept. When they come to Blackford House, they find that the lot on which the house is built is surrounded by an unusual forest called the Shadow Woods. Upon coming into the house (which is in awful condition) they spot a huge, unmoving clock that has animal-shaped holes where the numbers were supposed to be. Check out the book trailer of Watch Hollow.